Elias Balimponya is a Cohort III MSc student who completed his studies in Crop Science at Ohio State University (OSU). “Agriculture has the potential to solve unemployment especially among youth. Especially given the double digit economic growth expected to take place in Tanzania, many are starting to view the agricultural sector as a field where people can find employment regardless of their academic status,” stated Balimponya in a recent interview with Communications Intern, Kelvine Kazimoto. He was accepted to Ohio State University and wrote his MSc thesis on the Application of genomic selection and association mapping to breeding for resistance to rice blast and bacterial blight of Rice (Oryza sativa L.) in East Africa. 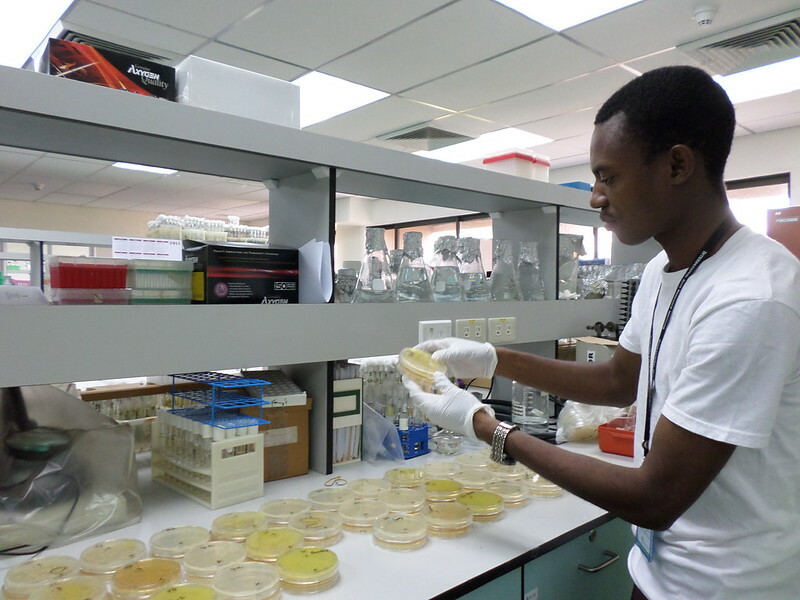 During his MSc, he carried out the field testing of 238 African and 180 USDA rice lines for resistance to rice blast and bacterial blight diseases and used the data for genomic selection and association analysis. “The overall importance of his research was to produce improved varieties of rice that would help farmers in Tanzania to have high yielding variety that can feed the future generations,” stated Balimponya. His supervisor at the Department of Horticulture and Crop Science was Dr. Clay Sneller, an experienced geneticist who has worked on wheat breeding, plant stress molecular biology, and genomics since 1991 Dr. Snell helped him not only with his research, but to adjust to his new learning environment. “I had to make a lot of adjustments. I especially had to adjust the way that I managed my time.” His accomplishments and performance at OSU led to his selection as a 2014 Norman E. Borlaug Leadership Enhancement in Agriculture Program (LEAP) Fellow. “Dr. Sneller helped me a lot when it comes to hard work. They taught me how to work hard but efficiently, just working with them helped him get more organized his my work and what I do.” In addition to the supervision by us US-based supervisor, Balimponya also spent a month working with Dr. Bo Zhou, a plant pathologist at the International Rice Research Institute (IRRI). ‘’Dr. Zhou assisted me with additional training in different software and technologies used in the genomic selection and association analysis process,’’ he stated. Balimponya overcame a number of challenges to adapt to his studies. As his studies progressed and after gaining additional training at IRRI, Balimponya refined his research idea until he was confident that he could implement the field research activities in Tanzania. Upon returning to Tanzania, his academic advisor Dr. Ashura Luzikihupi based at Sokoine University of Agriculture continued to guide him to acquire the academic and personal tools needed to carry out his research. Today, Balimponya serves as an Assistant Research Officer for the Tanzania Official Seed Certification Institute (TOSCI) with the Ministry of Agriculture, Livestock and Fisheries. His advice for future students is, “Where there is success, there are should be challenges so to make you strive further.” This year, Balimponya will also be an exhibitor at the TechTalent Innovation Fair taking place on July 22, 2016.